Flanesford Priory Celebrations01600 890 605work Wedding Ceremony VenueFlanesford Priory offers an absolutely stunning setting for special celebrations, dating back the 14th century it is a historical building mentioned in the Domesday Book. The Glebe Room is light and airy with a high beamed ceiling, stone wall and large windows looking out towards the breathtaking Wye Valley. At Flanesford Priory we offer the ultimate venue for any function – corporate events, weddings, celebrations or more informal dinner parties for families and friends, seating up to 50 people in the Glebe Room and Marquees are arranged for larger celebrations. 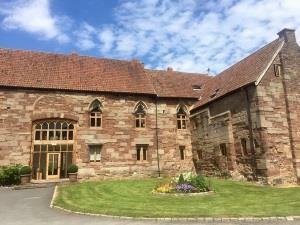 Flanesford Priory also offers you unique self catering apartments, sleeping up to 39 guests. The Bride & Groom can make a weekend of staying in the new converted ‘Cider Mill’ which is 5 star luxury accommodation. Flanesford also offers quality home cooking and professional Cordon Bleu offered by Izzie’s, co-owner of Flanesford with 25 years of renowned experience in event catering and organisation. Izzie’s prides itself on excellent quality home cooked food prepared with local and seasonal produce, presented to an exceptional standard. The menus are varied and can be adapted to suit your own requirements. Whatever the size of your special occasion, whatever time of year, we are more than happy to discuss your needs. Licensed bar available with friendly and experienced staff. At Flanesford we offer a bespoke service to suit every individuals requirements, please contact 01600 890506 for more information and to arrange a visit. Civil marriage and civil partnership ceremonies available, inside the Glebe Room or outside in the breathtaking gardens.